Patch 1.10 is now available for NBA Live 18. The latest title update includes various technical fixes for the online experiences, and also addresses an issue when changing lineups in Play Now. Please see below for the full patch notes. New rosters have also been pushed through. A couple of recent transactions are unaccounted for, though in some cases that’s a result of NBA Live 18 not reflecting the new expanded rosters with Two-Way players. Of course, with the roster editing capabilities we now have in the game, players like DeAndre Liggins and Trey Burke can be signed to their new teams. As always, the latest patch will come through automatically as long as your PlayStation 4 or Xbox One has an active Internet connection. If you encounter any difficulties, try restarting your console. 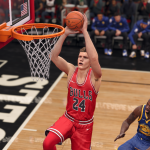 Feel free to add your thoughts on the latest update in the comments below, as well as join in the discussion here in the NBA Live 18 section of the Forum. You can also find a complete update history for NBA Live 18 here in our Wiki.